It is virtually impossible not to marvel at China’s new subway systems after spending some time in a city like Beijing or Shanghai. The relatively new subway systems allow for convenient and affordable (albeit crowded) way to travel around these cities. These infrastructure investments will certainly leave a lasting impact on Chinese cities for years to come, but what will this legacy be? On one hand, this massive commitment to public transportation could be interpreted as China learning the lessons from American sprawl, suburbia, and private car ownership. On the other, we could be looking at the development of sprawl with Chinese characteristics, with subway systems playing the same role as the American interstate. Urban planners generally consider sprawl to be bad- but why? Above all else, sprawl is environmentally and economically wasteful. By spreading out where people live, sprawl leads to infrastructure redundancy and the conversion of undeveloped land — land that could be used for agriculture or simply natural environment preservation (which provides a wealth of environmental services like improving air and water quality) — into developed land. Additionally, the further people live from where they work and play, the more likely they are to travel to those places by carbon-intensive modes of transportation (primarily the private automobile). Sprawl is the major defining characteristic of 20th century American growth.While there are numerous reasons why this is the case (including Federal housing policy that encouraged home ownership), one theory that helps urban planners understand sprawl and suburbanization is the bid rent theory. At the heart of this theory is the idea that choosing where to live or set up a business is about balancing access to lots of people and rent prices; land users’ willingness to pay rent is dependent on their need for access to the central business district (i.e. downtown). Commercial services and retail (the blue line on the graph in Figure 1) benefit the most from close proximity to downtown, its density, and its high concentrations of people; therefore, commercial and retail entities are willing to pay the highest levels of rent, and the areas closest to downtown are generally dominated by commercial businesses. Manufacturing and large retail (the green line) benefits some from access to people who work in factories and buy goods, but it also requires a greater area of land to set up production facilities; therefore, manufacturers and larger businesses often locate outside of expensive downtown areas but still somewhat close to the center. Finally, though living in the center of a city is very convenient, housing prices (i.e. rent) are quite high. Residential uses (the red line) are generally seen to benefit the least from access to downtown, so people therefore are willing to live further away from the city center. The further one move out of the city center, the lower housing prices become; therefore, the outer regions of cities are usually dominated by residential development. When the lines on the graph are translated into a two-dimensional map, the city is divided into concentric zones. The spatial distribution of commercial, manufacturing, and residential areas under the bid rent theory can be seen in Figure 2. Though the bid rent theory has its own limitations, it still provides a helpful way to understand American cities. In addition to the obvious information on willingness to pay rent for access to downtown by sector, bid rent graphs contain another important piece of information about consumer preference: the point at which each line crosses the x-axis (or where the rent becomes 0). The residential line is particularly important, as it shows the distance away from downtown where developing residential land becomes impractical (i.e. the land is worthless); in practice, this represents the outer boundary of cities. Before the development of interstates, city size was greatly limited by travel time. Even though land exists beyond where the residential line reaches the x-axis, additional non-financial costs (particularly commute time) made living in these areas impractical. The American interstate system had a profound effect on the slope of the residential line on the bid-rent curve. Interstates, with higher speed limits and limited stops, significantly reduced travel times from employment in city centers to housing miles away, thus reducing the non-financial cost of living far away from downtown. 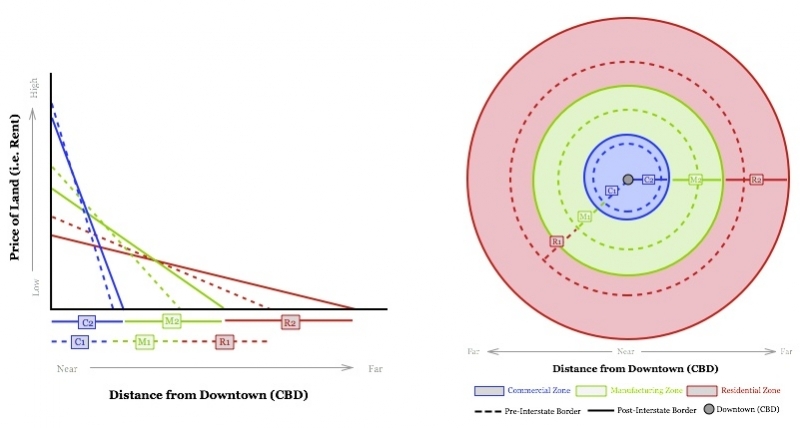 As the residential line became flatter, and the x-intercept moved further away from downtown (see Figures 3 & 4); this means that previously impractical land became a viable option for some individuals. Cities, once limited in size by travel time, were able to expand far further than they were before interstates. Fifty years later, interstates have allowed cities like Atlanta and Houston to sprawl to incredible levels. It’s easy to dismiss sprawling Chinese cities as inevitable, due to the large size of the population in an average Chinese city. However, the same factors that led to American sprawl (particularly a strong desire for homeownership) are also very important parts of Chinese culture. If homeownership is a significant priority yet housing prices remain unaffordable, the only option is to move further away from the city center. If an individual’s only transportation options are buses, bikes, or even cars, non-financial costs like travel time would effectively limit the size of Chinese cities; however, land further from the center becomes more attractive when citizens have access to high-speed transportation options like subway. Much like interstates did to their American counterparts, Chinese subways will flatten the residential bid-rent curve and allow for Chinese cities to grow increasingly expansive. 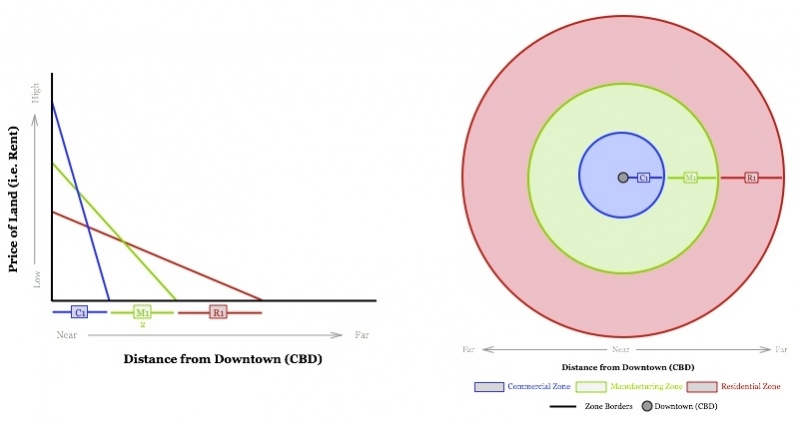 Though this may not seem like a major problem, increasing the distance from downtown to city borders by 25% means increasing the total developed area by 65%. That’s a huge amount of land that could be used for other purposes like farming and environmental services. There is a very compelling case for building these subways. The most compelling case is that China’s major cities are inevitably going to continue to grow. If Chinese cities do not develop extensive transportation infrastructure, then they may pay a major price in the future as they battle traffic congestion, environmental degradation, and high real estate prices (due to limited housing supply). Alternatively, one could also argue that outward urban growth is not inevitable; in its place, cities would either become increasingly dense or people would just choose to move to smaller, less expensive cities. Some urban planners argue that American cities are reaching “peak sprawl” due to suburban developments reaching reasonable limits on individual travel time from job centers; is it possible that Chinese cities would reach the same point? By increasing the area where city residents can reasonably commute to the city center, local governments are making land that was previously unappealing due to its distance from the city center more appealing (i.e. inducing demand). Rather than reducing traffic congestion, it could instead be enabling more people to move to these cities than would otherwise be feasible. This would put significant stress on existing infrastructure, encourage redundant infrastructure, and decreases green space surrounding cities. 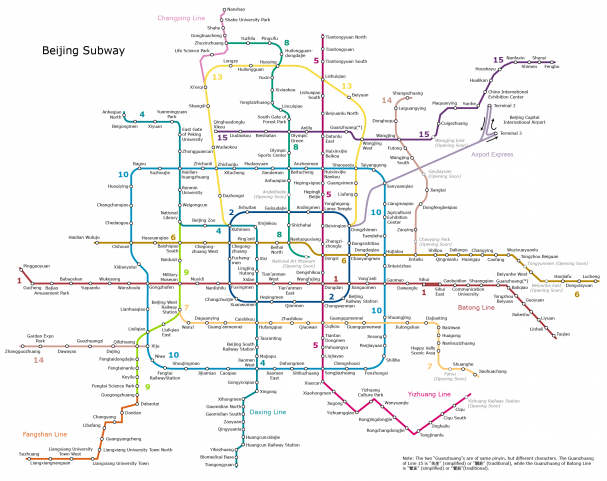 Building these major subway systems can also pose major systemic issues to Chinese cities over the upcoming years and decades. Over the past decade, China has been grappling with high real estate prices. In the short-term, the government decreases the necessity of dealing with high real estate prices in city centers by increasing the overall supply of developable land through subways. Long term, as individual purchasing power increases and more people buy cars, more individuals may transition from public transit like subways to personal cars. Chinese cities face problems that are unprecedented in both size and scale. Planning cities under these conditions is extremely challenging, and building massive transportation infrastructure is a logical way to manage the challenges that come with massive growth. It’s easy to marvel at the sheer size and speed of growth of Chinese transportation systems. That said, the growth of Chinese subway systems isn’t necessarily a sign that China is fighting off American-style sprawl and suburbia; rather, it may setting the foundation for sprawl with Chinese characteristics.